Duluth Animal Hospital has been honored to serve our community for over 38 years and we have always been dedicated to excellence in everything we do. We are proud that we have received numerous awards, including "BEST OF GWINNETT" award for 13 years. We are greatly humbled by this accomplishment and know our clients are the reason for our sucess. We were the first veterinary hospital in Duluth, and the first to receive accreditation from the American Animal Hospital Association. AAHA is the highest level of certification an animal hospital can achieve. This means we voluntarily comply with the highest standards in our profession and have undergone rigorous evaluations every 3 years since 1987. This keeps us on the cutting edge of expert medical care and surgery. "Every year, the Gwinnett Magazine editors go in search of the best. This includes months of research and thousands upon thousands of votes cast from our readers. In a community with 900,000 people living in 437 square miles, there are hundreds of businesses with an active, loyal following of exuberant fans. The field of categories is vast. The great companies represented are impressive. And the local pride and cooperative support is a great tribute to all who call Gwinnett home." 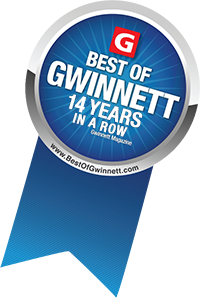 We have now received the Best of Gwinnett Award for 14 years, and we are greatly humbled by this accomplishment. This honor is voted by the community of Gwinnett County and we have been chosen from among the many animal hospitals in the county.